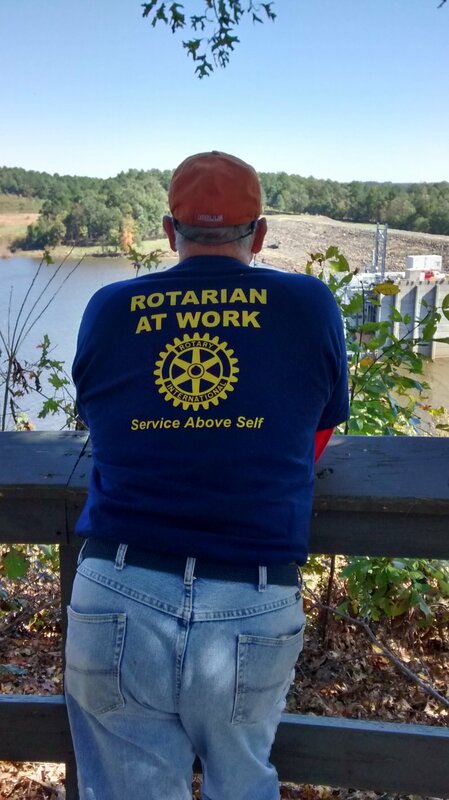 The Cary MacGregor and Apex Sunrise Rotary Clubs sponsored a fine morning of community service at the lake on Sat., Oct. 22. Several members of our meetup.com/helpcleanjordanlake and Ranger Jon Bannerman of the U.S. Army Corps of Engineers at Jordan Dam joined them. True to Rotary Club motto of "Service Above Self", 30 bags of trash and 3 tires were removed in 2 hours of work. The group cleaned along the shoreline of the far side of dam shown in the background of first photo. That work went so fast that we moved them over to a section of Kirks Creek off Jordan Dam Rd. where lots of trash accumulated after Hurricane Matthew. A celebration picnic was provided by the Rotary Clubs at the Visitor Assistance Center of the Corps. This was perfect spot to appreciate the importance of our mission in preserving the beauty of the lake.